It is hot, hot, hot. – These Two Eyes! Each day during low tide as the sea drifts away from the mainland masses of tourists rush to the coastline. A shovel can be rented from the small general store for the sole purpose of pitching it deep into the sand, then chucking the fine grains over your shoulder, digging deeper and deeper until the water starts to rise from the ground. When it does, watch out, because it’s hot baby! 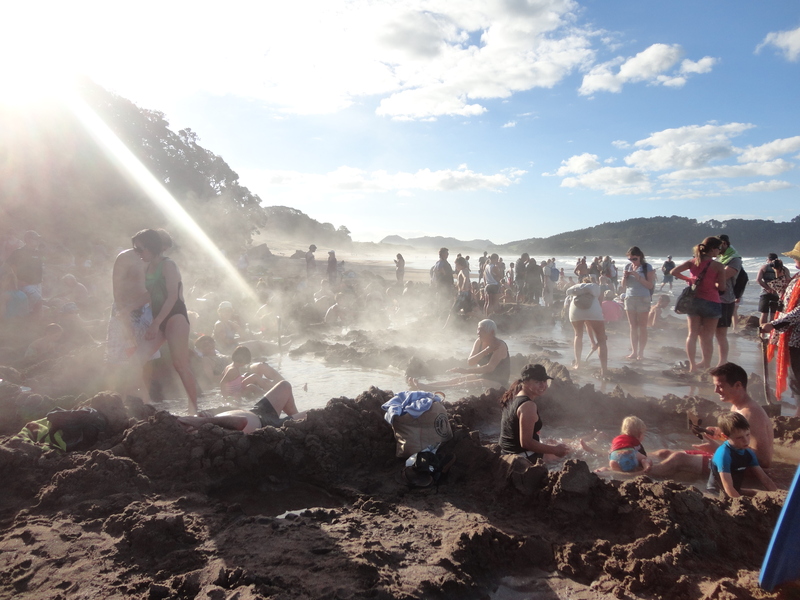 Welcome to Hot Water Beach, located on the east coast of the Coromandel Peninsula, New Zealand. Within two hours on either side of low tide, the water beneath the sand turns into hot pools, creating an exciting phenomenon drawing tourists and local families each day. Before arriving I wasn’t sure what to expect. Really, what was all the fuss about? But as I walked from the car park to the beach, then rounded the corner to the left passing the large rocks forming off of the cliffs I was amazed to see the plethora of people. 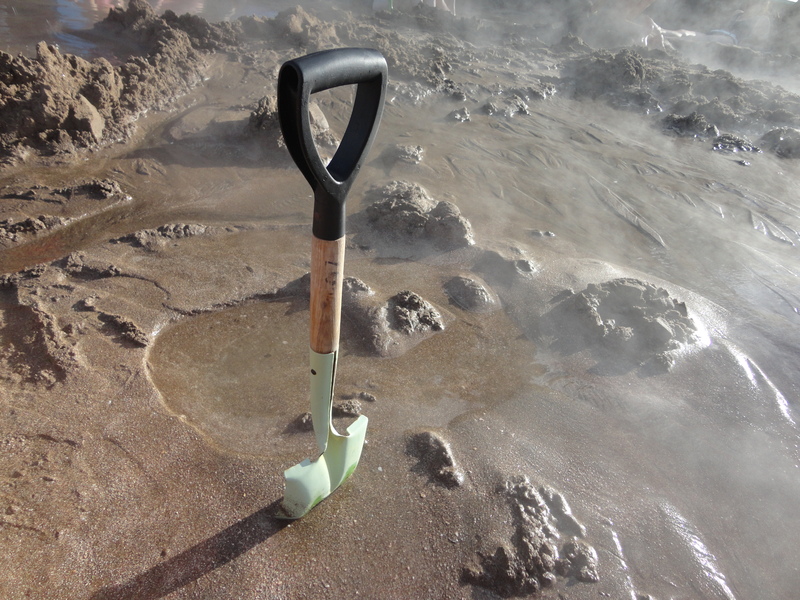 Many had already dug their pool and were sitting soaking in the geothermal haven. Others proudly did the dirty work, connecting one pool to another then another so others could share the thrill. Steam rose from various pockets across the small area on the beach where the inquisitive visitors gathered. We only had 5 spades between 15 of us, so I let the boys do the digging. As I stood around, feeling a bit guilty and quite lazy, a Canadian girl from the group had struck gold on the far side of the beach and was sitting in a pool abandoned by its creators. I ran over, cautious not too draw too much attention to our sweet find, but to my ignorance was shocked as I stepped from the sand into the small pool. Ouch, ouch, ouch, ouch! Perhaps they should rename the beach Really Really Hot Water Beach. Man, in mere seconds of my feet touching the water, instantaneously I pulled them back, did a bit of a hop, skip sort of dance, and rushed them into the cool ocean which was less than a few feet away. After that I had my fair share and had lost interest in actually submerging my entire body into the pool, saving the few spots that were vacated for the more eager guests. Past the masses lay a long stretch of empty beach. Carrying my flip flops in my hands, letting the scorch simmer in the refreshing ocean I walked along, spending a few moments to myself. As it began to turn dusk a few surfers made their way down the path and geared up for the evening swim. 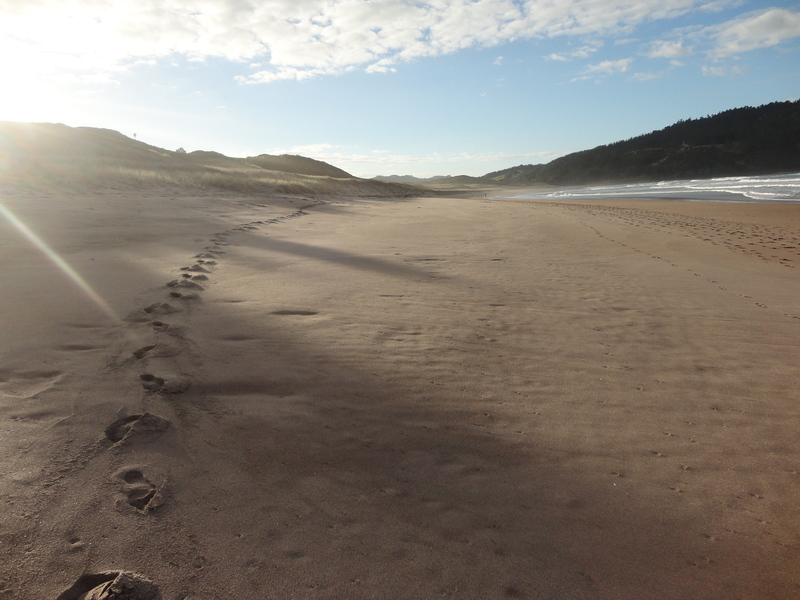 I positioned myself on the dunes, with the geothermal chaos to my right, the surfers paddling out in front of me, and endless beach to my left. Pretty neat little place.